Nias island is situated off the western coast of North Sumatra. Nias is a beautiful holiday destination popular amongst international surfers. However, despite this visiting wealth, Nias ranks amongst the poorest areas in Indonesia. Seventeen percent of people (22,720) live below the poverty line, which is set of $21.44. Average family size is 7 people and incomes are inadequate to cover basic needs. Poverty is a significant contributor to food insecurity and malnutrition. Most people are farmers who have traditionally grown commercial rubber. Unfortunately, the prices for rubber have collapsed, leaving the people destitute and desperate for alternative livelihoods. Building resilience and improving food security is a national priority, however, in the remote communities where SurfAid works, national policies and interventions are often ineffective. Food security is a multi-dimensional concept. Agricultural production, trade, income, food quality, clean water, sanitation, governance and political stability are all influence food security. This project increased food security by diversifying food sources, increasing household income and supporting nutrition sensitive health and sanitation activities. 13 community health/farmer groups have been supported to develop catfish, chicken and corn farms after assessment of their leadership capacity in previous activities. The groups are mostly women whose influence in contributing to improved food security is significant given their primary responsibilities for food production, purchasing, preparation and in feeding and care practices. Assistance was provided in the form of continuous coaching, technical support, business training and marketing guidance. Training and coaching was based on the farmer field school approach, a group-based learning process where farmers share their observations and analyse, together with a SurfAid facilitator/agricultural specialist, how to improve their harvests. 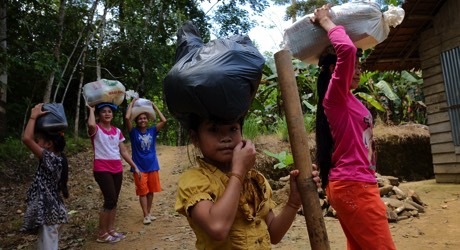 This project complements SurfAid’s ongoing efforts to combat ubiquitous food insecurity and malnutrition in villages where nearly one in four children are underweight and plain rice is the current dietary staple. 46 community groups have been trained on income generating activities and small business management. The training series consisted of sessions on planning and commodity identification, business plan development, value chain, savings/financial management, followed by technical training per selected commodity. At the end of the training series, the groups can apply for micro grants. SurfAid hosted a buyer/supplier meeting to facilitate direct contact between the community business groups and several restaurant owners in Gunung Sitoli, the capital of Nias. It was eye opening for the small business groups to learn about the high food-quality expectations that restaurants have. The meeting resulted directly in contracts for five community groups. SurfAid works together with a local bank (Bank Sumut) on their outreach program to provide low interest loans to small business groups or individuals. As a first step, they provided easy access for all groups to open bank accounts and even have provided a “mobile cashier” every week at the local government office. That means the communities can deposit and withdraw money without having to go to the capital city. At present, SurfAid is providing grants that do not require repayment to stimulate local business development and ensure financial stability before any debt is incurred by business groups. SurfAid and Bank Sumut will then provide capacity building assistance on financial management, loan repayment, and bookkeeping to groups recommended for micro-loans. A total of 25 groups are now managing small businesses: 17 Chicken farms, 4 catfish farms, 3 banana and sweet potato chip producers, and 1 group plants corn. The chicken farms are the most popular, with the fastest financial return: from hatchlings to chickens, they are ready to sell in just one month. Contrasted with catfish farms and vegetables/corn, the harvest duration is 3-4 months (excluding preparation). SurfAid works with communities to develop their own solutions that are culturally and geographically appropriate to the unique environment of remote islands. Using a ‘hand up, not a hand out’ approach, SurfAid develops leaders from within villages and builds their capacity to support the development of the community. 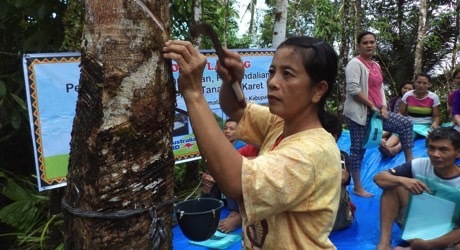 In conjunction with the villages themselves, SurfAid also works in partnership with the Indonesian government to achieve national priorities and increase the sustainability of achieved outcomes. SurfAid is implementing an overarching Mother and Child Health program in Nias that focuses not only on improving nutrition, but access to clean water and health education services too. This project is one of many smaller projects that contributes to the desired outcome of improved nutrition. Small food businesses provide two of the three requisite components to achieve this outcome: food availability and access to food (additional household income). Other projects within the program address health and sanitation factors that impact on food utilisation (the third pre-condition for improving nutrition). The archipelago of Nias is situated off the western coast of North Sumatra. Nias is a beautiful holiday destination popular amongst international surfers. However, despite this visiting wealth, Nias ranks amongst the poorest areas in Indonesia. Seventeen percent of people (22,720) live below the poverty line, which is set of $21.44. Average family size is 7 people and incomes are inadequate to cover basic needs. Poverty is a significant contributor to food insecurity and malnutrition. Most people are farmers who have traditionally grown commercial rubber. Unfortunately, the prices for rubber have collapsed, leaving the people destitute and desperate for alternative livelihoods. 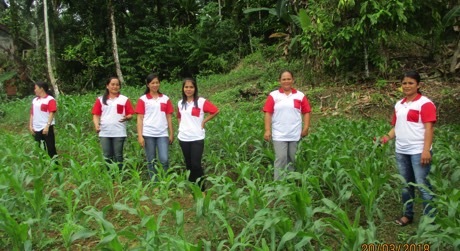 Surfaid, with the support of previous Footprints projects, has introduced nutrition gardens, and plans to expand on these with more intensive agricultural technical assistance to foster a food self-sufficient Nias. Physical AVAILIBILITY of food through increasing diversification of food sources. Food UTILIZATION; adequate knowledge of nutrition and child care techniques exists and is applied; and adequate health and sanitation services exist. This project will increase food security to improve nutrition by diversifying food sources, increasing household income and supporting nutrition sensitive health and sanitation activities. 13 community health/farmer groups will be supported to develop catfish, chicken and corn farms; they will be targeted based on their demonstrated leadership capacity in previous Footprints supported projects. The groups are mostly women whose influence in contributing to improved food security is significant given their primary responsibilities for food production, purchasing, preparation and in feeding and care practices. Assistance will come in the form of continuous coaching, technical support, business training and marketing guidance, which will all be based on specialised market chain assessments specific to Nias that will be undertaken by SurfAid staff. By working with community groups, SurfAid can facilitate farmer collaboration which means farmers can more effectively negotiate price, which in remote villages is a contributor to poverty where brokers purchase from rural producers under market value. Training and coaching will be completed based on the farmer field school approach – a United Nations developed approach that facilitates bottom up learning; it is a group-based learning process where farmers share their observations and analyse together with a SurfAid facilitator/ agricultural specialist on how to optimise their results. Surplus fish, chicken and corn from this project will be sold for economic gain but commodities will also be used to meet household dietary needs. This project will complement SurfAid’s ongoing efforts to combat ubiquitous food insecurity and malnutrition in villages where nearly one in four children are underweight and plain rice is the current dietary staple.